As of March 2017 an updated version of the SAP Hybris Commerce integration rapid-deployment solution, based on SAP Hybris Commerce 6.0, is available. As you might know already, the target is to quickly provide a starting point for your SAP Hybris Commerce integration project, accelerating the configuration, while you can focus on the business relevant part – creating your individual and competitive B2B and/or B2C web shops. The SAP Rapid Deployment solution (RDS) comes with pre-defined integration processes covering various use cases with integration to different back end systems. The highlights of this new RDS version are the integration of SAP Hybris Commerce with SAP Hybris Marketing Cloud and SAP Configure, Price and Quote for product configuration. Fig.1: Overview of integration scenarios as part of the RDS. Please note that those scenarios are mutually exclusive, addressing different target groups. Now let’s have a closer look at the latest content updates. You can now easily integrate the scope items B2C Commerce – Targeted Marketing with Segmentation and B2C Commerce – Targeted Marketing with Product Recommendation with the SAP Hybris Marketing Cloud. These integration processes support you to provide a personalized shopping experience in your web shop. The option for integration with the on premise version – SAP Hybris Marketing – is of course also still available and documented as part of the RDS. SAP Hybris Marketing Cloud is integrated via the Web Content Management Solution (WCMS) with SAP Hybris Commerce 6.0. The WCMS accesses SAP Hybris Marketing Cloud segmentation at runtime to check if the consumer browsing the web shop is assigned to a campaign. This information can be immediately used to provide targeted marketing information in the web shop for this particular consumer. For the product recommendation, sales orders placed in B2C web shop are replicated to SAP Hybris Marketing Cloud. There the data is used to generate for example most sold items based on recommendation algorithms. When a B2C customer logs on to the web shop, runtime calls to SAP Hybris Marketing Cloud retrieves the result of the product recommendation scenario. These are displayed as recommendations in the web shop. On the other hand, interactions, like interested consumer clicks on a recommended product to check details, are also captured. These clicks on a recommended product are communicated back to SAP Hybris Marketing Cloud as web interactions. These interactions help to monitor the success and the efficiency of a product recommendation scenario, for example with the impression and click through rates. Similarly, if a recommended product has been ordered (sales order) then this parameter (conversion parameter) is also updated based on the sales order data from SAP Hybris Commerce. Fig.2: Personalized information in the web shop based on product recommendations. 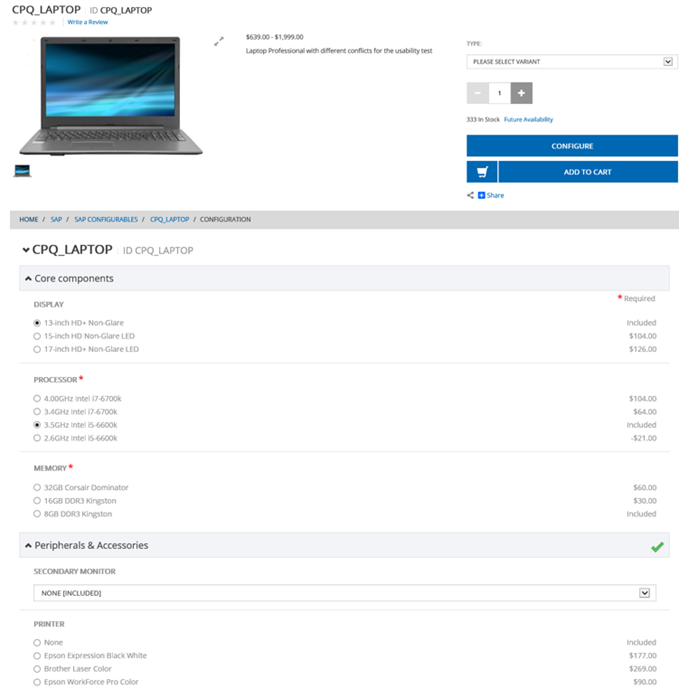 In case you want to sell complex, configurable products in your B2B Commerce web shop and you have configured those products with the variant configurator in SAP ERP, the RDS supports you setting up the integration. It describes in detail how to ensure that the master data like customers, products, configuration master data – including product model data and customizing data relevant for pricing – are replicated asynchronously from SAP ERP to SAP Hybris Commerce. As a result, business customers can enter complex configurations easily in the web shop, selecting options and values. The application guides the customer, asking for special values and checking allowed combinations. The seamless integration to the product models and prices defined in SAP ERP ensures that the product configurations in the sales order submitted by SAP Hybris can be manufactured and fulfilled in SAP ERP. Fig.3: Configuration of a single level product in the B2B web shop. Find more details about the SAP Hybris Commerce integration RDS in the SAP Best Practices Explorer. You can also check out this short recording to see the differences to the previous RDS version. By the way, you can use the RDS together with the latest release of our SAP Solution Manager 7.2, our well known Application Lifecycle Management platform, that runs now on SAP HANA and has a lot of great new features. For more details, see SAP Support Portal. Can you please provide more details on SAP Hybris Commerce integration with Hybris Marketing?? Also check in earlier releases (6.3 and lower).